With the end of 2007 around the corner, here we are again to update you on how we've been. Frosted backyard of our house. Frosted front of our house. Frozen car in our driveway. We still live in Holmdel, New Jersey. Here are some photos we took around our house. We had very little snow last Winter. We bought a snow blower in December of 2006 and still have not had an opportunity to use it. The little snow and ice we did have can be seen here. Our house right after snowfall. Lucia enjoying coming of Spring. Lucia and her 14-year old Rhododendron. Lucia walking in Holmdel Park in Spring. Farm in our neighborhood in Summer. Our driveway and house in the Spring. Our walkway in the Spring. Colors of Fall viewed from our backyard. Fall at Dimisa Drive. Fall came quite late this year and the reds and yellows lasted well into November. Our backyard deck in the Fall. George and Tati. Tati and George wed. In February Lucia and Mauricio traveled to the northeastern Brazilian state of Alagoas to attend the wedding of Tatiana, daughter of friends Marina and Sergio, and George. Friends of Tati and George, as well as of Marina and Sergio, traveled from as far as Switzerland to celebrate. Some of the people there were Geraldo, Manoel, and Karen, who used to work at Bell Labs in New Jersey and now live in Brazil, Virginia and Brad, who used to live in New York and now live in Geneva, Catarina and Richard, who live in New Jersey, and Els and Michael, who lived at the time in New York. We also met a bunch of people for the first time and made lots of new friends. Jangada, a popular boat in northeastern Brazil. Ocean seen from Marina's beach house. The wedding was fantastic. According to Geraldo Veiga, it was "the mother of all weddings." Lucia and Mauricio danced for hours. Check out more photos of the fun and the wedding here. Hanging out with friends in Alagoas. Mauricio and Geraldo Veiga admire the ocean. Lucia on a boat crossing a river in Alagoas. Sasha in November Sasha at home during Summer. 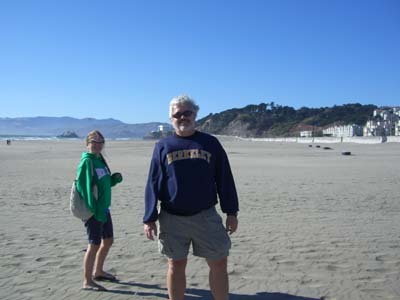 Sasha and Mauricio on beach in San Francisco. Sasha and her stuff at new apartment in Ann Arbor. Sasha in her room at new apartment in Ann Arbor. Sasha in New Jersey for Spring break. View from Sasha's room at new apartment in Ann Arbor. Sasha with blue book at University of Michigan in May. Linda Rhodes chatting with Marina Roesler and Sasha with André on Thanksgiving Day. Sasha turns 20 on December 31st. She finished her Freshman year at the University of Michigan and started her Sophomore year. She is majoring in Political Science, but also likes history and writing. Sasha lived in the dorms during her first year in Michigan but decided to share an apartment with two friends during her second year. Lucia flew to Ann Arbor in April to help Sasha move her things out of the dorm to a storage facility and Mauricio drove there with Sasha in May to move her things from the storage to the new apartment. The apartment has three rooms, a small living room and kitchen and one bathroom. It is very close to campus taking Sasha only five minutes to walk to her classes. Sasha joined the staff of the university's newspaper The Michigan Daily as a writer in the Arts Section where she is a pop music critic. Sasha and Alec on 17 Mile Drive in California in July. Sasha in Westwood (Los Angeles) near UCLA in July. Sasha came home in February for Winter break, in April for Summer vacation, in October for Fall break, in November for Thanksgiving, and in December for Christmas. Alec, Lucia, and Mauricio really like it when Sasha is home. 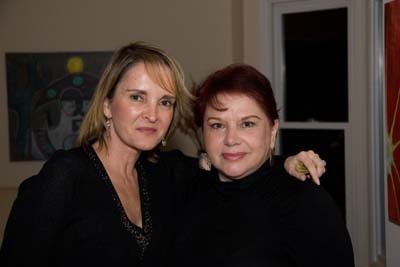 Sasha traveled to Brazil with Lucia in May to visit family. She had not been to Brazil in two years. In July, she traveled with Mauricio, Alec, and Alec's friend Adam to visit universities in California. For 2008, Sasha plans to attend Michigan in the Winter and Fall and work as an intern either in New York City or Washington D.C. during the Summer. Sasha and Alec posing in front of a Renalva at home in Summer. Sasha and Alec having fondue for Alec's 16th birthday. Sasha with cousin Gabriel and aunts Regina, Ana, and Vera. Sasha and Alec at Sushi restaurant in California in July. Sasha over the Pacific near Big Sur, California in July. Sasha and Alec with Maria during Thanksgiving. Sasha with Lucia and aunts Regina, Ana, and Vera in Rio in May. The trip to visit universities in California was for Alec and his schoolmate Adam, but at the last moment Sasha asked if she could come, too. Mauricio and Sasha had already made a similar trip to California two years earlier. The goal was to visit five universities on an eight day road trip. 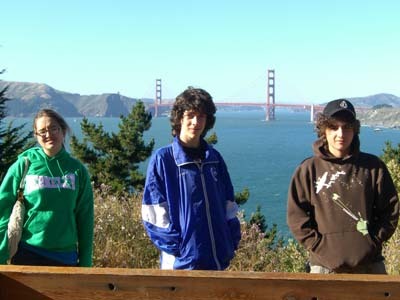 Sasha and Alec with Adam Rhodes-Rogan in San Francisco. Sasha and Alec with Adam Rhodes-Rogan in downtown San Diego. Sasha and Alec with Adam Rhodes-Rogan at San Diego Zoo. Sasha and Alec with Adam Rhodes-Rogan at Stanford University. We traveled on a Sunday morning from Newark to Oakland and spent Sunday afternoon as tourists in San Francisco. We slept at Silvia's home in Richmond. She and her daughter Joana (Mauricio's god-daughter) were in Brazil at that time. We did just catch Zé Emerim home. In a few days he, too, left for Brazil to go to the Pan American Games in Rio. Then we visited UC Berkeley on Monday, Stanford University on Tuesday and that same day traveled to Los Angeles via the Pacific Coast Highway and State Route 1. Wednesday was 4th of July (Independence Day) and we spent the day as tourists in Los Angeles. On Thursday we visited UCLA and backtracked to Santa Barbara, where we visited UC Santa Barbara on Friday. That afternoon we traveled to San Diego where on Saturday morning we finally visited the last university on our list, UC San Diego. We spent Saturday afternoon visiting the San Diego Zoo. Sasha and Alec with Adam Rhodes-Rogan at UC Santa Barbara. Sasha and Alec resting at Silvia's house in California. Geisel library at UC San Diego. Sasha at 17 Mile Drive near Carmel, California. Sasha with Lucia and Alec home for Thanksgiving. Lunch near Big Sur, California. On early Sunday morning we drove 500 miles on from San Diego to Berkeley and on Monday morning we traveled back from Oakland to Newark. Alec and Adam went on another university trip. In October, Linda Rhodes (Adam's mom) took them to visit the University of Connecticut. Alec with Adam Rhodes-Rogan at UCLA. Alec at Silvia's in California. Bay view from Berkeley Hills, California. Alec with Adam Rhodes-Rogan at 17 Mile Drive in California. Alec turned 16 on August 3rd. At the end of 2007, he was a junior at Holmdel High School. He has a pretty heavy load in his junior year, taking four honors courses and advanced placement computer science. He is decided on studying computer science in college. In March and June of 2008 he will be taking his SATs. For that Alec is enrolled in SAT prep classes which he attends about twice a week. Over the summer, Alec redesigned Lucia's jewelry website. Alec admiring the Pacific Ocean, near Big Sur, California. Alec with Adam Rhodes-Rogan at Music Library, UC Berkeley. Alec with Adam Rhodes-Rogan at UCLA. Stanford University. Alec sunbathing on grass where Lucia used to sunbathe. Alec playing bass with Birdhouse Party Crashers at Bayonet Farm in Holmdel. Lucia at Bayonet Farm in Holmdel for Alec's concert. Alec playing bass with Birdhouse Party Crashers at Holmdel High School. Outside of school, besides hanging out with his friends, Alec's two main activities are playing in his bands and playing soccer for the Torpedoes, the travel soccer team in which Mauricio is an assistant coach. He also enjoys programming and playing acoustic guitar. In the first half of the year, Alec played bass in a band called Birdhouse Party Crashers. Besides winning Holmdel Idol, the Birdhouse Party Crashers played a number of concerts. 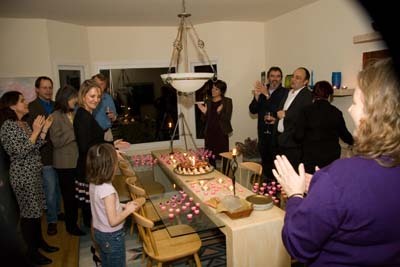 For a video of the Party Crashers, click here. Alec and two other band members left the Party Crashers in August to form a new band. Having turned 16 on August 3rd, Alec enrolled in a driving school in August and after six classes got his driver's permit in September. Alec raking leaves at home in November. 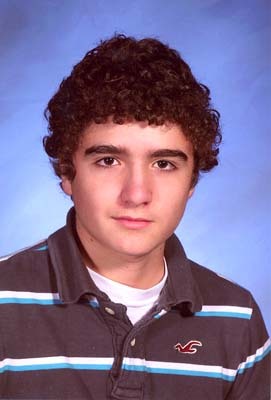 Alec in 11th grade high school yearbook picture. Alec continued playing travel soccer for the Torpedoes. This year his team achieved a remarkable feat. They qualified to play the finals of the NJ State Cup at Fort Dix, NJ. They won the semifinal match 8x2 but lost the final, ending up with the silver medal. 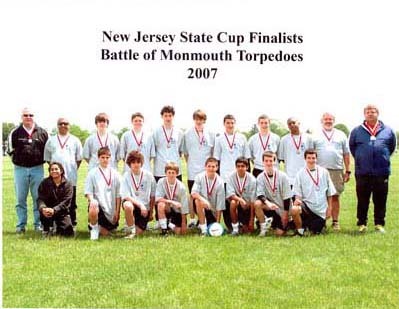 Torpedoes 2nd place NJ State Cup. Alec playing soccer in February in cold New Jersey. Alec at home in December. Lucia cutting her birthday cake. Lucia chatting with Sergio Lira in the background. Lucia in May. 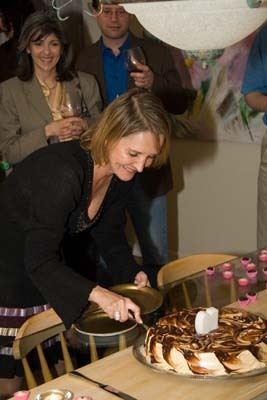 Lucia turned 50 on March 8th. To celebrate, we had a big party. Friends sing happy birthday for Lucia. Lucia and cousin Maria Luiza. Lucia with baby Clara Elise in NY City. Mauricio and Lucia at home in December. At AT&T, Lucia continues in the same group working as a network architect. In April, she took part in a big meeting in San Antonio, Texas, for over 6000 AT&T managers. Lucia at The Alamo in San Antonio, Texas. Lucia and colleagues with then AT&T Chairman Ed Whitacre in San Antonio, Texas. Lucia traveled to Brazil three times this year. Her father's health was in continuing decline and Lucia wanted to be near him during this period. She saw him in February and May and was about to travel to see him again. 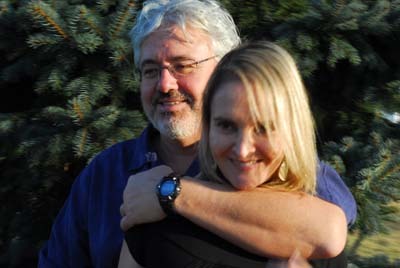 Sadly, he passed away on September 13th, a few hours before Lucia's flight. Lucia arrived in Rio in time for his funeral. His ashes were spread on the slopes of Sugar Loaf Hill in Rio. Orestes had worked there in the beginning of his career in TV and had a special connection with Morro do Pão de Açucar. Mauricio put together a website to commemorate Orestes Lucio's life. Lucia with sister Ana Lucia in Rio in September. The Polverellis at the Sugar Loaf in Rio. The Polverellis at the Sugar Loaf in Rio. Lucia with her Dad, Orestes, in 1992. Lucia with sisters Regina Lucia and Ana Lucia and brother Orestes Lucio. Mauricio with baby Felipe in Gainesville, Florida. 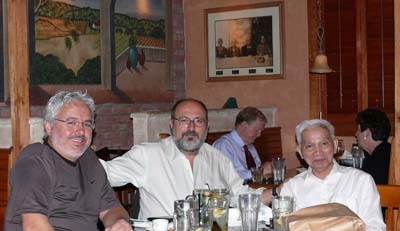 Mauricio with Panos Pardalos and Hoang Tuy in Gainesville, Florida. Proud grandfather Tuffy Habib with Felipe in Gainesville, Florida. 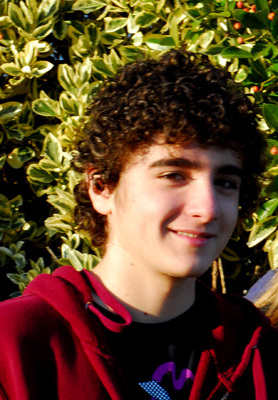 Mauricio continues to work at AT&T Labs Research in the Algorithms & Optimization Research Department. His work takes him to many nice places around the world and brings to New Jersey many nice people to work with him. In February, Mauricio traveled to Gainesville, Florida to attend a conference organized by his friend and colleague Panos Pardalos. João Lauro Facó and Renalva, Mauricio's Mom, in Itaipava, Brazil. Trail near our house in Itaipava, Brazil. In March, Mauricio traveled to South America. He was invited to teach a short course on Optimization in Telecommunications at the CIMPA-UNESCO-URUGUAY summer school in La Pedrera, Uruguay. On his way to Uruguay, Mauricio stopped in Rio to visit his mother, Renalva, in Itaipava, about an hour drive from Rio. In Rio, he stayed at João Lauro Facó's apartment at Joatinga beach. View from Facó's apartment at Joatinga in Rio. Our house in Itaipava, Brazil. South Atlantic Ocean at La Pedrera, Uruguay. View from Mauricio's hotel room in La Pedrera, Uruguay. After Uruguay, Mauricio visited Luciana Buriol at the Computer Science Department of the Federal University of Rio Grande do Sul in Porto Alegre, Brazil. Luciana is Mauricio's former Ph.D. student and spent 15 months working with him at AT&T in 2001-2002. She is now an assistant professor at UFRGS. Mauricio lecturing at CIMPA UNESCO school in Uruguay. Mauricio with Luciana Buriol at Federal U. of R. Grande do Sul in Porto Alegre, Brazil. In April, Mauricio traveled to Spa, Belgium to attend the 2007 edition of the International Network Optimization Conference (INOC 2007). Spa is famous for its Spas and Formula 1 racing. The conference was next to the famous Les Thermes and the conference dinner was at the Musée du Circuit de Spa-Francorchamps in Stavelot. Mauricio in downtown Spa, Belgium. Mauricio at Les Thermes in Spa, Belgium. View from Mauricio's hotel room in Spa, Belgium. Les Thermes de Spa. Mauricio with colleagues at INOC 2007 conference banquet at Musée du Circuit de Spa-Francorchamps in Stavelot, Belgium. Mauricio with Henrique Pacca at Les Thermes de Spa. Mauricio at Grand Place in Brussels. In July, Mauricio traveled to Montréal to attend the 2007 edition of the Metaheuristics International Conference (MIC 2007). Mauricio at the École des Hautes Études Commerciales de Montréal during MIC 2007. Montréal, Canada. MIC 2007 was held at the same time as the Montréal Jazz Festival and Mauricio was able to spend a few hours at the festival. Mauricio with Ana Viana, Paola Festa, and Éric Taillard in downtown Montréal. Mauricio with Brazilians attending MIC 2007 in Montréal. Mauricio with Ana Viana at Montréal Jazz Festival 2007. Mauricio with Paola Festa in metro in Montréal. Later in July Mauricio traveled to California with Sasha, Alec, and Alec's friend Adam Rhodes-Rogan. On the last day there, they all had dinner with Mark Vukalcic, an old friend of Mauricio's from his days back at UC Berkeley. Mauricio with Sasha in 17 Mile Drive in California. 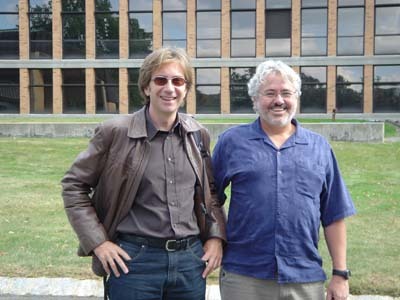 Mauricio with Mark Vukalcic in Berkeley, California. Mauricio at Brazilian Operations Research Society annual meeting (SBPO 2007) in Fortaleza, Brazil. 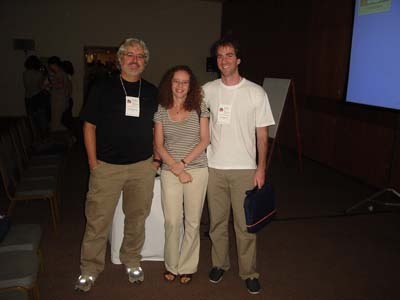 Mauricio with Débora Ronconi and Ernesto Birgin at SBPO 2007. 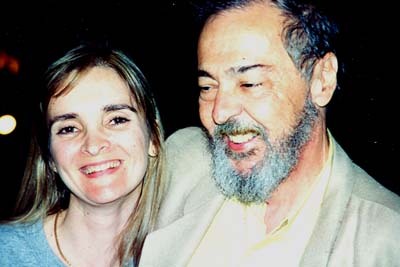 Mauricio with Luciana Buriol in Fortaleza, Brazil during SBPO 2007. In August, Mauricio traveled again to Brazil, this time to give a short course on optimization at the Brazilian Operations Research Symposium (XXXIX SBPO) in Fortaleza, Ceará. Mauricio's brother Marcio performs for Mauricio and friends in Fortaleza, Brazil. Mauricio with brother Marcio in Fortaleza, Brazil. Both of Mauricio's brothers (Roberto and Marcio) live in Fortaleza. Mauricio enjoyed very much seeing them. It had been seven years since he had not seen Marcio. Marcio is a jazz musician and arranged to play for Mauricio and some friends at a nice bar in Fortaleza. Click here to sample some more of the music Marcio played. Colorful plants at Mauricio's Mom's house in Itaipava, Brazil. After Fortaleza, Mauricio spent a week on vacation in Itaipava with his mom and in Rio. His brother Roberto was also in Itaipava as was Geraldo Veiga. Mauricio with his mother Renalva in Itaipava, Brazil. Mauricio with his brother Roberto in Itaipava, Brazil. Mauricio's mother Renalva reading her email in Itaipava, Brazil. Mauricio's brother Roberto with his mother Renalva in Itaipava, Brazil. In October, Mauricio was a participated in an NSF proposal review panel in Alexandria, Virginia. He drove from Holmdel and stayed with friends Telba and Ilan Irony in Potomac, Maryland. In November, Mauricio traveled to Seattle to attend the Annual Conference of the Institute of Operations Research and Management Sciences (INFORMS 2007). In Seattle, Mauricio also visited the Boeing Everett Plant, where Boeing 757, 767, 777, and the new 787 are assembled. 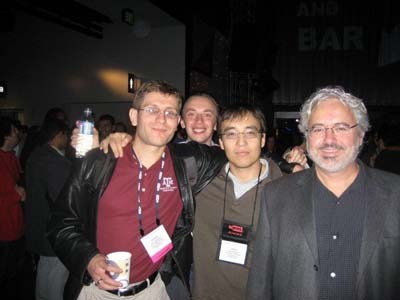 Mauricio with Sergiy Butenko, Vladimir Boginski, and Oleg Prokopyev at INFORMS 2007 conference reception at the Experience Music Project Museum. 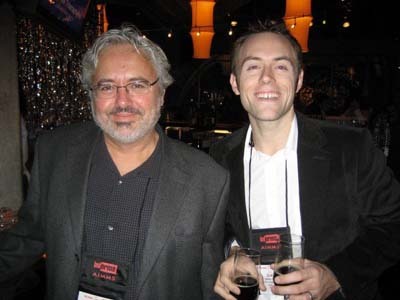 Mauricio with Clayton Commander at INFORMS 2007 conference reception reception at the Experience Music Project Museum. Mauricio's Ph.D. student Thiago Noronha walking home in Madison, New Jersey. Mauricio with Abilio Lucena in New York City in January. Ana Viana in her office at AT&T Labs Research. 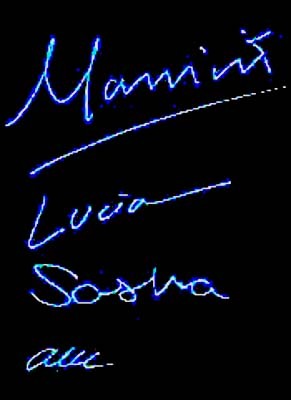 This year Mauricio and Lucia had many visitors. Débora Ronconi and Ernesto Birgin (from São Paulo), who were spending a short sabbatical leave at Princeton University, came over in January for a barbeque. Thiago Noronha (from Rio de Janeiro) worked with Mauricio on his Ph.D. research from September 2006 to March 2007. He will finish his Ph.D. in April of 2008 and was just offered a job at Google's R&D Center in Belo Horizonte. Abilio Lucena (from Rio de Janeiro), Mauricio's friend from back in college, visited in January with his wife Anna and kids Marina and Pedro. Ricardo Paula (from Rio de Janeiro), designer of much of the furniture in our house, and married to a cousin of Lucia, visited us in April. Ana Viana visited Mauricio from May to July. Ricardo Paula during visit to New Jersey in April. Ana Viana (from Porto, Portgual) spent three months of her sabbatical leave from INESC Porto working with Mauricio. Before MIC2007, Paola Festa (from Napoli, Italy) spent one week with us working with Mauricio. After MIC 2007, Adriana Alvim (from Rio de Janeiro) stopped by on her way back to Brazil. Adriana Alvim and Lucia's cousin Maria Luiza having breakfast with us in July. Sardinhada, a typical Portuguese sardine dish made for us by Ana Viana. 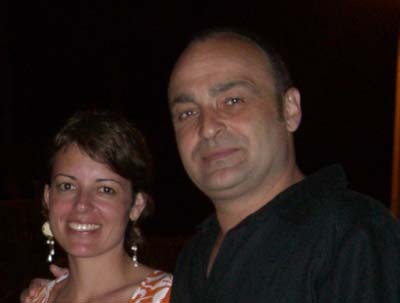 In October, Rafael Martí and his wife Mila visited us from Valencia, Spain. Mauricio and Rafael started a research collaboration this year. Also in October, Ricardo Silva (from Lavras, Brazil) arrived in New Jersey for a four-month visit to study English and do research with Mauricio. In December, Ricardo was awarded a Brazilian Science & Technology Council (CNPq) post-doc fellowship to work with Mauricio. His post-doc will start in May of 2008 and last 12 to 18 months. Rafael Martí with Mauricio at Bell Labs in Murray Hill, New Jersey. 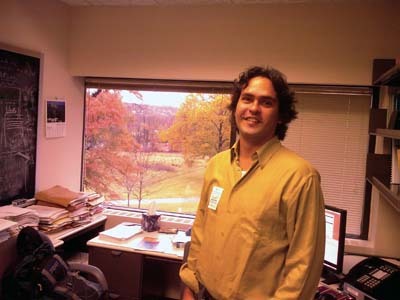 Ricardo Silva in Mauricio's office at the Shannon Laboratory. 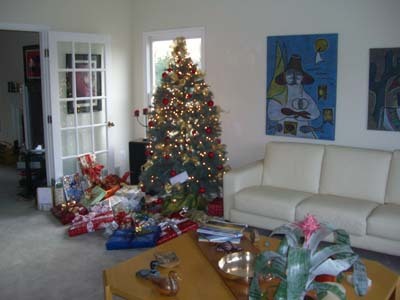 Our Christmas was calm. The four of us enjoyed the company of Maria Luiza (Lucia's cousin), Ricardo Silva, and Sergio Lira. Christmas tree the day before Christmas. 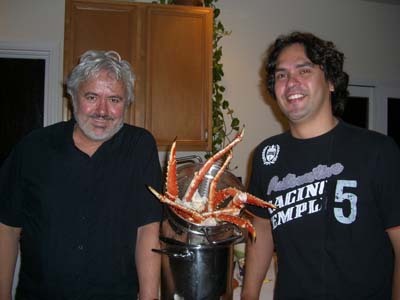 Mauricio with Ricardo Silva about to prepare king crab legs. Finally, we say goodbye, and see you soon, to Els and Michael, who moved from New York to work in London with their beautiful daughter Clara Elise. Our friends Els Henckaerts and Michael Linden ... ... and their daughter Clara Elise, moved to London. 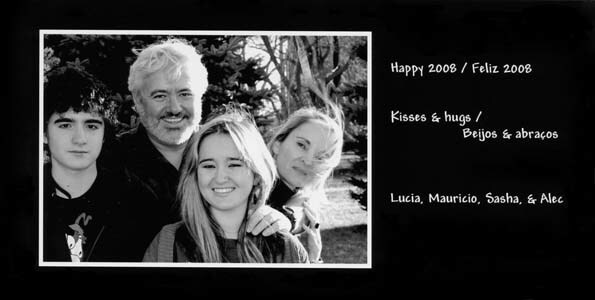 We wish you a 2008 full of health, happiness, and success.